Kneeling pad and bath cushion glued together. The assembled tub with gifts. 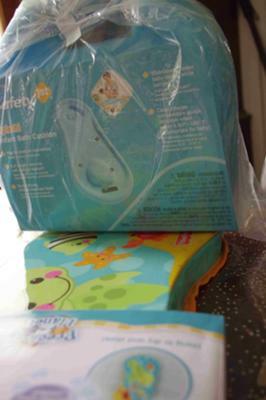 We had a lot of items for a baby shower, and once I looked at all of them together, I realized that most were bathtime-related. So, instead of making a diaper cake, I made a bathtub shape and filled it with all of the goodies. First, I looked at pictures of old-fashioned clawfoot tubs for inspiration. I used the kneeling pad as the base, and the bath cushion as the backrest. I placed a few pieces of invisible tape on the top surface of the kneeling pad and some on the plastic bag of the cushion. I put hot-melt glue on the tape and held the two together until it had set. This kept the cushion at just the right angle. 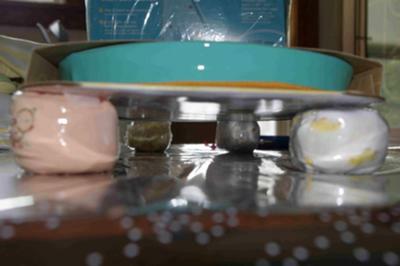 (The invisible tape protects the surfaces from damage from the hot-melt glue.) I also reinforced the pad with an extra piece of cardboard so that it stayed straight in the middle. I opened a 36-count package of newborn-size diapers and fanned out a pile of 10 lengthwise on a long sheet of plastic wrap. I rolled the wrap around them and secured it in a few places with more tape. This kept the diapers clean and made them more stable for building. I made another row of 10, and two rows of 8. 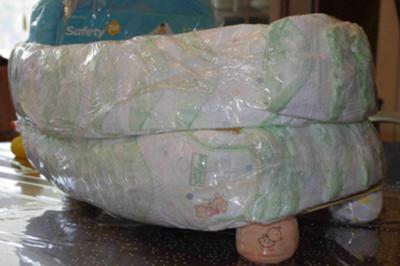 I used a tape gun and clear packing tape to secure the rows of diapers to the kneeling pad on the bottom, the cushion at the end, and to each other. Using the rows of 10 on the bottom, and the rows of 8 on the top worked well for forming the tub sides. Once the sides of the tub were made, I opened a receiving blanket and used that to conceal the diapers, taping it with invisible tape to the bottom of the kneeling pad. (The tub feet should still be visible.) I draped the extra blanket corners over the sides. Then I used a hooded bath towel to cover the cushion, and draped that around the end of the tub. Last, I filled the tub with the rest of the gifts, using the heaviest items first, and ending with pairs of socks and the rubber ducky on the sides of the tub. I wrapped clear “Cello Wrap” around the entire tub, tied it at the top with a narrow satin ribbon, and added decorative ribbon around the outside. The mom-to-be was surprised to see that there were even more gifts hiding under the blanket and bath towel, and was thrilled with them all. It was a big hit!